50 miles or 100k ? I originally registered for the 50-mile distance at Bishop, then flip-flopped in my mind for weeks over which distance I should do. The courses are the same for the first 48.5 mies, then the 100k runners do a 12-mile out-and-back before going to the finish. To make it even more mentally challenging, this 21-year-old race has a tradition that allows 100k runners to downgrade to 50 miles while on-course. At 48.5 miles, you see a downhill road to the finish and an uphill road to your remaining 12 miles… you decide. Bishop is high and dry. My longest previous race was the inagural Gold Rush 100k last year. That race was flat and at sea level, though the temps were through the roof. I wanted to upgrade to the 100k to further my training for my first 100-miler (TRT in July) and to challenge myself to my next “hardest race to date.” With this in mind, I finally committed to the 100k. I expected everything about the race to make it my hardest physical endeavor to date (other than childbirth). The initial 20-mile climb could be long and sandy. The heat could be relentless. Leaving for the 12-mile out-and-back could be unbearable. As it turned out, there was light cloud cover in the morning and the climb was less steep and more scenic than I imagined. Fuzzy shadows and soft light bathed the snow-streaked peaks. I wished I was carrying my phone to snap some photos. I reached the scenic overlook at the top of the course much earlier than I expected, but the next 18 miles running at an elevation of 8000+ feet was more difficult than I realized based on my reading of the course profile. Furthermore, someone turned up the thermostat and the cloud cover burned off. This part of the course was much slower for me than I was expecting. It turns out that Marisol is not only a delightful person, but our running style and strengths are strikingly similar. She is more experienced than me and has a number of Bishop finishes under her belt, so she wisely advised that we take it easy on the hot descent. We decided to stick together unless something unforeseen came up. By the time we reached the final 12-mile out-and-back, there was no difficult decision to make. We knew we were both finishing the 100k course. Unfortunately, this climb up Sage Summit, down the other side and then back again, was again more challenging than I understood from the course profile. Nonetheless, we continued pacing each other as we watched the sun fade behind the jagged mountain peaks. I had predicted a 15- to 16-hour finish from the beginning. Early in the day I thought it would be on the shorter side, but as the heat turned up and the “non-climbing” sections of the course took longer than I calculated, it was clear that I was again looking at a longer finish. I was feeling better now that the evening had cooled and Marisol and I were pulling each other along. We took a quick drink at the final aid station about 1.5 miles from the finish and continued cruising strong until suddenly there were intersections with no course markings. Because the course had been so exceptionally well-marked, I knew this had to be vandalism, but that didn’t help decipher the correct direction to turn. By this time we had grown to a group of five runners. Fortunately, Marisol had a general recollection of the course and that helped. We didn’t get more than a few hundred feet off course, but we did spend 5-10 minutes running back-and-forth and looking for ribbons before I suggested that we turn at the site of a race sign-post that had obviously been stripped of its signage. I was delighted when we passed through the campground to the cheers of my fellow Donner Party Mountain Runners and then my husband ran us into the finish. I returned to the campsite and enjoyed visiting with friends and hearing how the hubby monitored my progress via the DeLorme inReach satellite tracker that I carried. I’m really happy with my 15 hour, 35 minutes finish. You would think it’d be difficult to be happy when you finish hours after your friends, but not actually… we’re each just out there doing our thing, and we all face different challenges in different ways. I can’t express how much I appreciate their support and encouragement. Plus it’s super-fun to see your peeps on the out-and-back sections. For me, it was the most difficult course that I have completed, but it was not my most difficult day running. Despite the uncomfortable heat and evening wind, I never thought, “man, I’m gonna die.” And at the end of the day I didn’t feel like I’d left anything on the table at the end, either. Just the right balance for a race on the road to my first 100-miler. I think I did a good job following Betsy’s advice. Huge thanks to Betsy for her unconditional friendship, to Marisol for kindly sharing the day with me, to Pete B for goading me to upgrade to the 100k, to my daughter Clara for making a custom lucky race bracelet, to my son Alex for being my biggest fan, and to my husband Javier for absolutely everything. P.S. It was fabulous to have the family camping right there. I loved having them around and I hope they had a good enough time to keep tagging along. 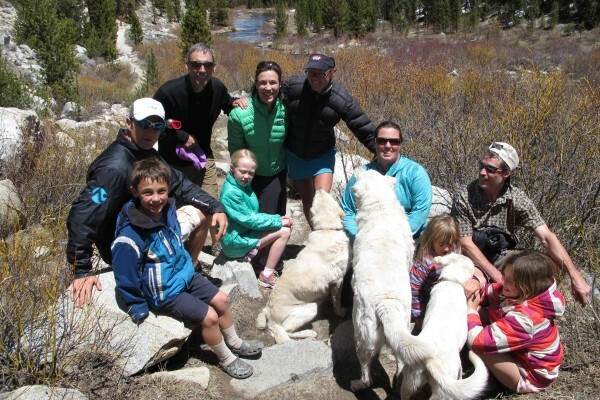 Runners and our families taking a recovery hike after Bishop High Sierra. Nice to hear from ya, Cathal! Next year, k?!? I don’t know if I’d have the same determination to continue on to finish 100k at the 48.5 mile point. Congrats on continuing on and finishing! As Betsy says, ” Ultras are 80% mental.” Thanks for the note!